Advanced training for young hunters. The latest research and tactics for hunting success. Public works that benefit hunters. With all this and more, it's easy to see why NRA is the number-one hunters' organization in America. For more information, call us at (800) 492-4868 or email hservices@nrahq.org. Recognized as the most comprehensive youth hunting program anywhere in North America, the Youth Hunter Education Challenge is NRA's "graduate studies" program in outdoor skills and safety training for young hunters. Open only to those who have completed hunter safety training at the state or provincial level, the YHEC program is conducted under simulated hunting conditions to provide the best practical environment for reinforcing and testing a young hunter's skills. NRA Outdoors Hunting & Fishing Destinations provide hunting and fishing guide services personalized to each client from fields and forests, streams and oceans all over the world. This program has developed relationships with outfitters that offer top-notch amenities, success rates, trophies bagged, personnel and more. 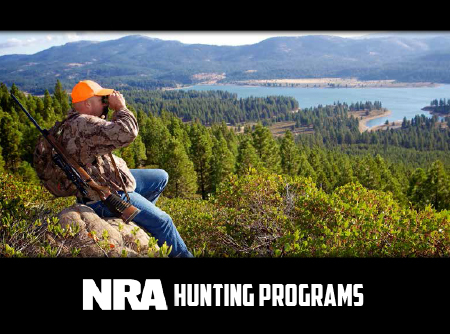 The NRA Hunter Clinic Instructor Program, developed by NRA Hunter Services, is a program in which skilled hunters teach beginner and intermediate hunters. Instructors have the opportunity to share their skills and knowledge about hunting in North America. The NRA Women's Wilderness Escape provides women 18 and older with an eight-day getaway opportunity to experience the softer side of firearm education with exposure to a wide variety of shooting sports activities and an array of enticing hunting and outdoor related activities. Whether you are a novice or a seasoned outdoor enthusiast, it's an experience that will prepare you for your next adventure! The NRA Clubs & Associations Department provides services and assistance to a network of over 14,000 NRA-affiliated clubs, associations, and businesses. Contact us at (800) NRA-CLUB (672-2582) or via email at clubs@nrahq.org with any questions.